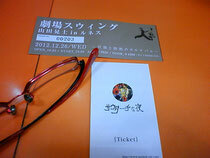 I went to see Koshi Yamada who is famous singer ! How are you doing ? How is your Xmas ?! Tne other day,I slipped down stairway,so I injured back. Please take care of your steps. By the way,yesterday I went to Okayama Pref, for enjoying Koshi's Carnival. Koshi is famous performance acter,channson singer live in Tokyo. I have great esteem for his ability,his personality. He played guiter & sing,with 2 musician,Saburo played Accordion,BandBoss Fukushima played Maccaferri guiter. Some cute and passionate Dancers sometime dance with their music. Hall create splendid atmosphere . We had excellent time with them. I wish you everything is well ! This particular article was in fact just what I was searching for!